evilcoffeechick: You sent me a message earlier; I was asleep. evilcoffeechick: I'm a little busy, yeah. evilcoffeechick: That honestly doesn't matter. What matters is lack of time, and principle. I don't run off to meet /anyone/ who just messaged me on YIM. evilcoffeechick: What sort of 'good time'. evilcoffeechick: Uh-huh. Right. If we meet. 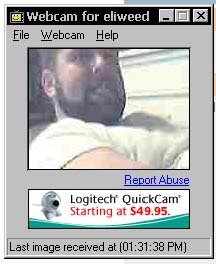 evilcoffeechick: Tell me, why does your little webcam thing only ever get a shot of your arm? evilcoffeechick: Well yes, obviously. You're trying to meet me, and you won't point it at your face? eliweed: where do you live? evilcoffeechick: Currently, denver, rather past Buckley. eliweed: u have a pic? evilcoffeechick: So you've already seen my profile. And probably my 'marital status'? evilcoffeechick: You misinterpreted that, didn't you. "Long term relationship" means I'm IN one. evilcoffeechick: Hmm. Do you have a full picture you could send me? eliweed: is there a chance we are gonna meet? evilcoffeechick: Well, I guess if I'm not going to get a full picture out of you, or anything else, I might as well stop playing around. No, there's no chance in hell we're going to meet. I don't cheat on the guy I'm with. I do however have a lot of fun getting stuff through this to post to my idiot archive on http://evilcoffeechick.com and to the messageboard at http://gremlin.net -- I think you might already have been up there once, too. evilcoffeechick: oh, no need to stop it now; it's too late; I've already got shots of you.